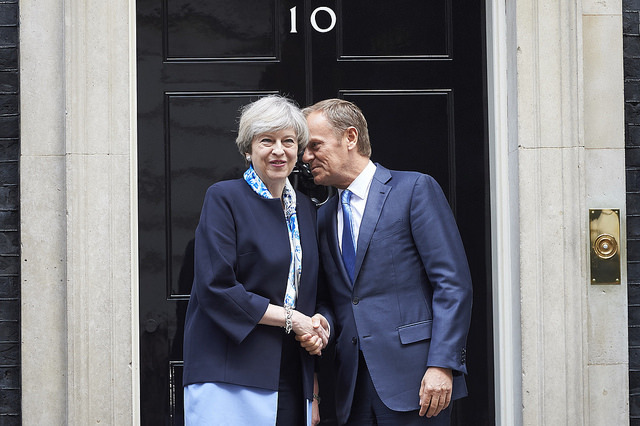 The UK’s negotiating position outlined before the election appears under pressure as the prime minister, Theresa May, no longer has a parliamentary majority to sustain it. And as the negotiations start, the Government has not been forthcoming in making public its Brexit priorities after the general election, so the assumption is that they have not changed. The outcome of the election has increased the influence of those within the Conservative Party, such as leader of the Conservatives in Scotland, Ruth Davidson, who favour membership of the single market, continuation of free movement and building cross-party consensus over the direction of Brexit. David Cameron and Michael Gove have voiced the need for a wider consensus on Brexit as well. The expected controversial “supply and demand” agreement with Northern Ireland’s Democratic Unionist Party (DUP) has knocked May’s “no deal is better than a bad deal” mantra on the head. A solution to the Irish border issue – which requires a deal – has moved top of the agenda. But until the UK government sits at the table and outlines its negotiating position, the EU is hostage to the partisan interests of the Conservative government. As Michel Barnier, the EU’s chief Brexit negotiator put it, talks should start when the “UK is ready”, but that: “I can’t negotiate with myself”. After meeting British negotiators Olly Robbins and Tim Barrow on June 12, Barnier told journalists he needs a British delegation that “is stable, accountable and that has a mandate”. Once the UK triggered Article 50 — which began a two-year countdown to leaving the bloc — in March, the balance of power tilted in favour of the EU, putting pressure on the UK: the clock starts ticking and the costs of a possible cliff-edge scenario (no agreement) are to be borne by the UK alone, while the EU27 can share the burden. Despite the legal disagreement on whether Article 50 can be withdrawn once triggered, Article 50 and the Council’s negotiating guidelines do afford the EU flexibility tools to adapt to changes during the process. These include the possibility to extend the formal two-year negotiation period and to agree transitional arrangements. They do not require the intervention of the Court, and their calculated deployment as the negotiations unfold could help the EU limit future uncertainty. And any extension to the negotiation period requires the agreement of the EU27. But it is not currently in the EU’s interest to either use this ability to extend the talks – or to press pause. Doing so would give the momentum back to the UK, and allow it to switch on and off the Article 50 process at will – which goes against the spirit of the article itself. The pressure of the two-year time frame on the British government is evident in reports of an EU threat to delay Brexit negotiations for a year if the UK insists on negotiating the terms of a new trade deal at the same time as its divorce proceedings from the bloc. Barnier’s mandate is to negotiate the UK’s withdrawal from the EU – not a future trade agreement. If the UK insists on negotiating an exit and a trade agreement in parallel, Barnier would need a new mandate from the European Council – and agreeing this might take a year. All the while, the Brexit clock continues ticking, and the time frame to negotiate a deal shortens. Extending the two-year negotiation period would require the unanimous support of the EU27. The EU has shown an unprecedented ability to ensure that its member states speak with one voice in the face of Brexit. The experience of other highly politicised negotiations such as EU accession, have shown that the member states are able to leave aside their egoistic national preferences to pursue the collective EU interest. This discipline will be tested during the Brexit negotiations as member state preferences may change. Both the UK and the EU are however amenable to temporary transitional arrangements to facilitate the implementation of an exit agreement. These could be used to address sensitive issues derived from the negotiation and thus address uncertainty, whether the negotiation period is extended or not. The EU has successfully used transitional arrangements to help ease the impact of recent enlargement rounds. Even without the current changing domestic climate it is in the UK’s interest to agree transitional arrangements to ease the impact of Brexit, and to cover the interim between leaving the EU and agreeing the terms of a future relationship. Politically, the EU is in a much stronger position than it has ever been since the Brexit referendum. The 27 EU member states have presented a solid, unified voice over Brexit. The Eurosceptic threat has weakened after pro-European Emmanuel Macron’s electoral success in France Angela Merkel’s expected re-election in September. The Eurozone’s economic performance has also recently improved. It is to the EU’s advantage to harness this political capital and press on with the Brexit negotiations while it is in a strong position, rather than accommodating the needs of a weakened British government. Under the current time frame, the deadline to reach a divorce deal is the end of March 2019. If there were to be a delay, European Parliament elections, scheduled for May or June 2019, could potentially limit the length of any extension to just over two months so that the Brexit process would not overlap with the campaign and vote. If a delay did mean negotiations coincided with the 2019 elections, these are typically fought on national issues and the status of Brexit negotiations may well have some impact on voters’ choices. Of course, British MEPs would be contesting an election to serve a shorter term. There is no need for the EU to delay or press pause before the Brexit negotiations start. The EU has tools at its disposal to adapt to a changing environment now that the Article 50 process has been set in motion. In the meantime, the Brexit clock is ticking and the pressure to get talking is felt more strongly in London than in Brussels. An earlier shorter version of this article was published in The Conversation. This entry was posted in brexit and tagged Article 50, Barnier, brexit, Brexit negotiations, David Davis, DUP, EU, theresa may by policybristol. Bookmark the permalink.